Here we have the best of both worlds: a ground-based total solar eclipse image from Akademgorodok, Siberia, in Russia merged with two space images from the ESA/NASA SOHO spacecraft. 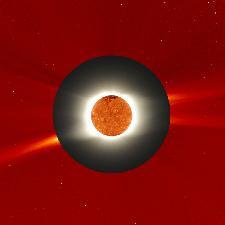 Though SOHO can observe the Sun itself and can observe the outer part of the solar corona with one of its LASCO coronagraphs, the "doughnut" between those images is not visible from Earth except during total solar eclipses. The central Sun image from SOHO in extreme UV light shows the sun at temperatures around 1 million degrees K. The outer image from SOHO shows gas at the millions of degrees, typical of the sun's extended corona. Merging the eclipse image with the space image from SOHO allows astronomers to trace features in the corona from their bases on the Sun's surface up until the gas escapes into interplanetary space. (The sun image from SOHO was taken about 6 hours after the eclipse photo.) We extended the view of the eclipse image further beyond the LASCO occulting disk into the corona so that we could see more features of the eclipse image. Eclipse image credit: Williams College Expedition: Jay M. Pasachoff, Bryce A. Babcock, William G. Wagner, Matthew Baldwin, Katherine DuPre, Marcus Freeman, Marek Demianski, (Paul Rosenthal).